As dignitaries from around the world gather for the United Nations Climate Change Conference, attendees are unlikely to champion a recent study that demonstrates oceanic heat levels – and not man-made greenhouse gases – are to blame for increases in temperature on land. Not so fast, says a study released earlier this year by Gilbert Compo and Prashant Sardeshmukh of the University of Colorado and National Oceanic and Atmospheric Administration, and presented in the scientific journal Climate Dynamics. According to Compo and Sardeshmukh’s study, all the greenhouse gases humans have dumped in the atmosphere over the last 46 years – the primary factor most climate change proponents cite to blame humans for global warming – haven’t affected land temperatures at all. The rise in land temperatures, the study states, can be tied directly to increased heat and humidity coming from warmer oceans, which in turn, the study admits, may be caused solely by natural forces. 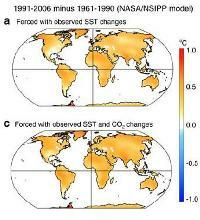 The study’s conclusions were based on models of land surface temperatures from 1960 to 2006. The scientists forced the models to project temperatures accounting for only the known rise in oceanic heat levels from that time and negating any effect of an increase in man-made greenhouse gases. In other words, the study found that rising land temperatures can be explained by increased warmth and, particularly, humidity from the oceans. Man-made greenhouse gases, the study found, haven’t significantly affected land temperatures. But if rising land temperatures are caused by rising ocean temperatures, what’s causing the earth’s seas to heat up? The study admitted it could be anthropogenic, man-made, but it could also be due to increased sun activity, underwater volcanoes or simply the earth’s regular patterns.